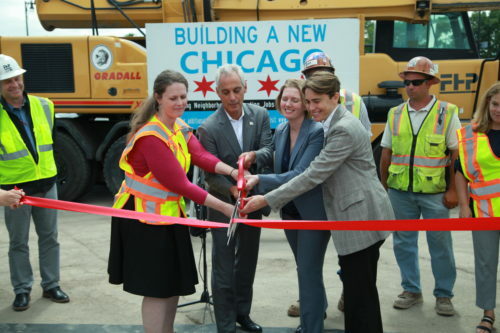 The Western/Belmont Avenue Viaduct demolition and intersection reconstruction project was officially deemed completed on July 24 at a ribbon-cutting ceremony. 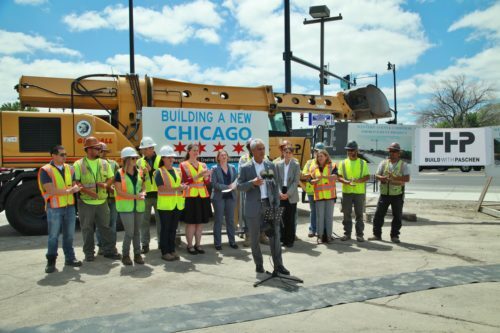 Chicago Mayor Rahm Emanuel attended and made remarks about the project. The viaduct, he said, was “an eyesore” that needed to be removed due to its age and condition. It was built in the mid-1960s to accommodate traffic for Riverview Park, which stood at the site until 1967. F.H. 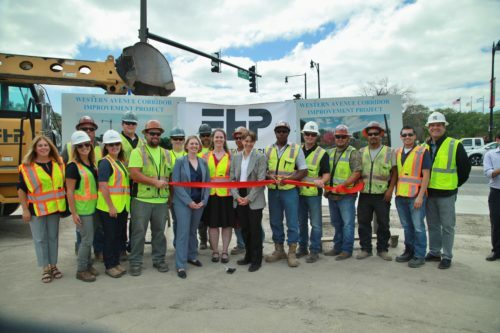 Paschen demolished the structure over one weekend in March 2016, which kicked off a 16-month transformation of the intersection. We rebuilt Western Avenue between the Chicago River Bridge and West Roscoe Street, and widened some of the cross streets along the route. A new deck was built for the Chicago River Bridge, and we updated lighting, sidewalks and medians, sewers, signals, streetscapes, and landscaping. Our team put many long hours into completing this important project for the City of Chicago. We are proud of what they accomplished in such a short time.